Much like Fallout 3, Fallout: New Vegas will end when it's over, but Obsidian is taking steps to make it easy for players to go back and keep playing once they've seen how everything wraps up. One of the most common complaints about Fallout 3 centered around the finality of the original ending. When it was over, it was over, as was any hope that players might have had about wandering the wasteland like some sort of latter-day Captain Walker. The Broken Steel DLC changed the big finish, making it open-ended, but if you weren't up to paying extra to get it, you were out of luck. In spite of that negative reaction, the same is planned for Fallout: New Vegas. In the second part of the Fallout: New Vegas "Fan Interview," Obsidian's Josh Sawyer said the studio "really wanted" to let players keep going after the grand finale, but that doing so wouldn't fit with its vision for the game. "Ultimately we realized that supporting post-endgame content would jeopardize the quality of the ending, which we wanted to tell the definitive stories for all of our major factions, locations and characters," he explained. "Instead, after the credits roll the game will prompt you to reload a save created just before the endgame sequence, allowing players to go back and complete any quests they may have missed," he continued. "Additionally, we make it very clear when you're about to reach the end of the main plot, so it shouldn't come across as a surprise." Obsidian is, however, ensuring that the game can be finished without any killing - or, conversely, with nothing but killing. "There are ways to win the main plot by killing no one and by killing everyone. It was one of our initial design tenets," Sawyer said. "You will find it difficult to get by as a pacifist, and you will miss a great deal of content by killing everyone you meet, but it can be done." 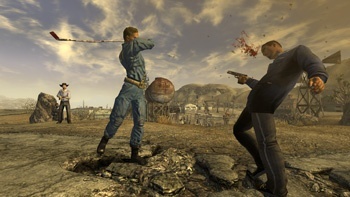 Fallout: New Vegas is scheduled for release on October 19 for the PC, Xbox 360 and PlayStation 3.